Some writers have tried to draw a parallel between the golem and later science fiction stories involving created beings or robots, including claims that Mary Shelley and Karel Capek of Rossum's Universal Robots (the play that introduced the word "robot") drew from the golem legend - though the connection is tenuous. Despite superficial similarities, golems are very much religious creatures animated by will and magic, not science. It may be more accurate to say that the golem legends happened to tap into later anxieties about technology and how we can never fully control the things we create. Once they hit the popular culture, golem stories tended to fork in two directions. Golems on film and television hewed to their religious origins and the persecution themes of the original stories. The silent film The Golem set the stage for this, and later golem appearances on The X-Files, Supernatural and even Extreme Ghostbusters dealt with themes like anti-Semitic violence. Games, on the other hand, overwhelmingly took the golem-as-robot approach - and that was due to Dungeons & Dragons reshaping the golem legend as we know it. 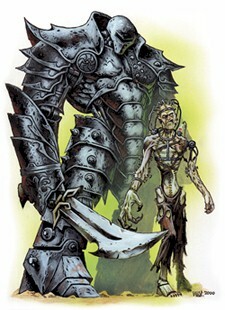 Golems first appeared in games in 1975, when D&D's first supplement Greyhawk included flesh, stone and iron golems. The creature's appeal seems obvious, in retrospect, since golems allowed Gygax to include what are essentially killer robots in a fantasy setting. But more than introducing golems to games, D&D also changed them for a generation of role-players. Importing golems into a world where Judaism didn't exist largely broke them with their religious overtones, allowing them to evolve into a different creature entirely. This began with separating golems into subtypes based on their material, an action that made their points of reference closer to science fiction than mysticism. Flesh golems resembled Frankenstein's monster. Iron golems looked like robots or Talos from Jason and the Argonauts. Clay golems retained the more traditional elements of the golem legend - they're made only by clerics out of soil - but their existence in a non-Judeo-Christian world rendered the creation subtext moot. All retained the golem's tendency to go berserk and rampage out of control. Other games followed D&D's lead, turning golems into a fantasy staple - they were boss fights in Terraria, creatures to summon in Diablo II and yet another thing to build in Minecraft. So drastic was this transformation from a religious to a secular form that even Promethean: The Created - which linked its Tammuz lineage with the Golem of Prague - eschews the traditional origin story and themes, instead presenting them as reanimated corpses obsessed with breaking out of slavery. But more than severing their religious connection, D&D also standardized the golem's appearance. Folkloric golems were almost never described, apart from being humanoid and large. In early stories, they even looked so much like humans that only a clever rabbi could tell the difference by noticing that the golem couldn't speak. While early D&D golems looked like Frankenstein's monster or animated statues, as the editions progressed they took on a shape all their own. Shoulders broadened and arms bulged. The head shrunk and sank to the front, eliminating the neck and settling the golem in a permanent bow. Long arms brushed the ground, like a rocky gorilla in a linebacker uniform. These touches form a brilliant design that simultaneously emphasizes the creature's strength, subservience and lack of intelligence. This is the golem we see today, from Clash of Clans and Dragon Age to Marshmallow, the monstrous snowman in Disney's Frozen. Though riven of its origins, it still retains its lineage as a dull, violent thing - a club come to life. Like many other monsters, the golem has changed over time. It evolved from a creation metaphor to a mythical defender of the Jewish people before breaking into the cultural consciousness as a powerful elemental force. So the next time you face down a stone monstrosity in Castle Ravenloft, be careful - that's centuries of history you're up against.